This week I gave a webinar on different ways of sharing family history findings with your family. (It was originally broadcast 18 November 2014.) While preparing for it, I became fascinated by the idea of creating a genealogical photo calendar. I was inspired by a genealogical wall calendar created by an NEHGS member. Each month’s photo is of an ancestor. The blocks for specific days are annotated with genealogical data: specifically, birth and marriage dates of ancestors as well as of living relatives. For the past few years I’ve been creating calendars, at Shutterfly.com, for my mother-in-law and for my sister. My mother-in-law gets a wall calendar with a recent photo on each month and all current family birthdays marked. My sister gets a desk calendar with an old family photo for each month. Looking at the wall calendar, it occurred to me: I could do a calendar just like his. All I have to do is choose twelve family photos, one for each month, and then “populate” a calendar with ancestral birth and marriage dates. Because I’ve used Shutterfly in the past, I turned there to make a start. I chose a basic calendar template. “Drag a photo to any date to mark a special event,” I read. 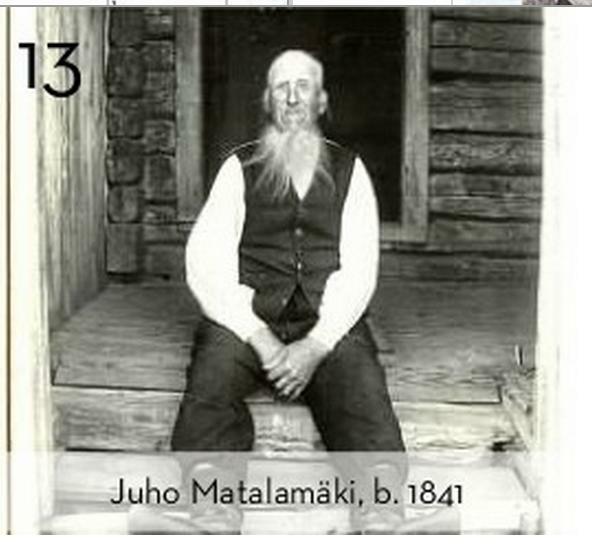 Stored at Shutterfly already, from my past calendars, is a great photo of my great-grandfather, Juho Matalamäki. I looked up Juho’s birthdate: 13 August 1841. I selected the month of August, and dragged the photo to the 13th. There it stuck! Then I double-clicked the date, and up popped a window to add text. “Juho Matalamäki, b. 1841.” Voila. One down. Excited by that success, I knew it was time to become more methodical. I chose a focus for the calendar – both my and my husband’s families, back three generations – and uploaded additional photos to have on hand. Then I made a list of all the relevant birth and marriage dates. I turned to January to start. The 28th: my mother, Pearl Isaacson, born in 1912. I dragged in a photo of the whole family, concerned that everyone would look really tiny in the square. But I discovered that Shutterfly will help me edit the photo first, so I cropped everyone else out. There’s Mom’s sweet face, all by herself, on her birthday. Shutterfly is only one of many companies that will help you make photo calendars (and books, for that matter). Others include Mixprint, Snapfish, and Vistaprint. Just search for “photo calendars” in your browser and see what turns up. In the meantime, I’m on a roll. And I sure hope my kids enjoy their holiday present! I did that for several years (until my meager ancestor photos were done), choosing a different family line for each year. January got the oldest photos, coming down to a recent family photo by December. Now I’m onto yearly Christmas ornaments, again using a different family line each year. What a great way to share our genealogical work with family! I have enough photos to do something like this, and it would be a great way to get some relatives involved who aren’t so interested. And might even bring out some old photos people have but don’t think about! Thanks for passing on the idea. This is an excellent idea and perfect timing for the holiday season. While you’re at your relatives homes, see if you can grab some old pictures and create a great gift for them for the holidays. Thanks for sharing this idea! What a terrific idea. Last Feb. my granddaughter was born. She will never have a chance to meet any of her great grandparents. I’m going to make one with photos of her great-grandparents with events in their lives. Great way to inspire a future genealogists! Good stuff! I enjoy using “zazzle.com” to turn the photographs of my ancestors into commemorative postage stamps. It’s an informative way to send a birthday card to a child, or perhaps to any family member, to help introduce them to their family history via official U.S. Mail. It’s great to send that special occasion card with my Great Great Grand Grandfather Wilcox driving the stage coach looking on as the card arrives! I’m glad to hear the idea has been inspiring–and I’ve also been interested to learn that others have been making calendars for years. I guess I came late to the party! And now new ideas: ornaments and postage stamps. I’d love to see photos. What a great idea! I do this every year with recent family pictures but never thought of doing a genealogically-related one. You have inspired me! After attending this webinar, I made a family history calendar for my mother for Christmas. She loved it! Thanks so much for this great idea.